When I was a kid, I used to go lie in the rain on the roof and watch the lightning. Hey, it was better than fireworks, free, and delivered to your door. What can I say? It was, of course, ball lightning, although at that time physicists denied such a thing could exist. Now they don't, but it's a hard thing to explain. Which is why this research is so interesting. A team at Tel Aviv have created ball lightning in the lab. Eli Jerby and Vladimir Dikhtyar from the University of Tel Aviv in Israel created a laboratory version of ball lightning using a "microwave drill." The device consists of a 600-watt magnetron taken from a domestic microwave oven and uses a powerful microwave beam to bore through solid objects. The researchers aimed the beam through a pointed rod and into a solid object made from glass, silicon and other materials. The energy from the drill created a molten hot spot in the solid object; when the drill was pulled away, it dragged some of the superheated material along with it, creating a fire column [video] that then collapsed into a bright fireball that floated and bounced [video] across the ceiling of the metal enclosure. 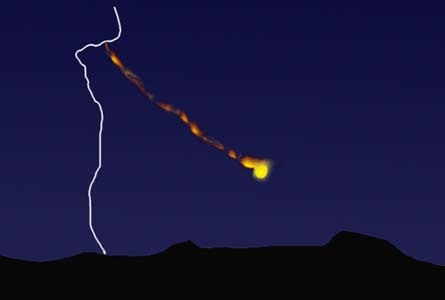 "The fireball [looked] like a hot jellyfish, quivering and buoyant in the air," Jerby said. The glowing object measured just slightly over an inch across and lasted only about 10 milliseconds. The work was detailed earlier this month in the journal Physical Review Letters.